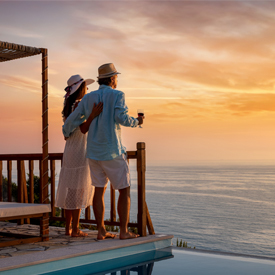 You probably expect that your all-inclusive vacation will keep you fed, entertained, and well hydrated, but you might not realize how truly comprehensive some resorts are, which is why All-Inclusive resort vacations have become an increasingly popular vacation. Options abound for singles, couples and multigenerational families. What are you looking for in your vacation? Five-star luxury or moderate budget; a sprawling mega complex or an intimate boutique resort; family friendly, adult-only or couples-only? How about dining options? Buffet or a la carte restaurants, fine dining or global cuisine. The options are endless when it comes to entertainment and activities: snorkeling and diving, golfing, spas, tours, shows and more. We’ve experienced the resorts first hand to provide personal recommendations that ensure you find the right all-inclusive getaway to fit your lifestyle, your budget and your vision. One up-front price: Accommodations, meals and beverages, entertainment, gratuity, taxes and fees are included for one price. Stunning settings: Beach side locations in the Caribbean, Mexico and Central America offer pure relaxation and fun. Endless dining options: Casual to fine cuisine in a variety of gourmet venues will satisfy any palate. Fun: An array of activities and entertainment from Broadways shows to yoga on the beach. Amenities: Drinks, sparkling pools, beaches, Kid’s Clubs, spas, adults-only havens and more. Choices: From adults-only to family and budget-friendly to supreme luxury, there’s an all-inclusive resorts that sure to be a fit for you. The laid back islands of Caribbean, Jamaica, Negril, Ocho Rios Montego Bay, Dominical Republic, Punta Cana, Bahamas, Aruba, St Lucia and Turks & Caicos offer colorful architecture, calypso beats and widely varied cultures and cuisines. Mexico’s popular resort destinations like Cancun, Riviera Maya, Puerto Vallarta and Los Cabos offer festive music, friendly locals and mystical Mayan ruins. Both Mexico and the islands of the Caribbean offer year-round warm temperatures, powdery sand beaches, bright turquoise water and endless possibilities for adventure and relaxation. Enjoy Endless Privileges, Your Way at Zoetry Wellness & Spa Resorts, Secrets, Breathless, Dreams, Now and Sunscape Resorts & Spas - a collection of trusted, and luxurious AMResorts. A day at a Bahia Principe All-Inclusive resorts offers tropical paradises with amazing beaches, palm trees and exquisite service. Ibersostar Hotels & Resorts will make you 'Feel Like a Star’ with deluxe accommodations, delicious dining options, a world of entertainment, friendly staff and beachfront activities for the entire family. With a wide range of accommodations, entertainment, and adventures, Barceló Hotel Group (comprised of Royal Hideaway Luxury Hotels & Resorts, Barceló Hotels & Resorts, Occidental Hotels & Resorts, Allegro Hotels) create the vacation experience you desire at their all-inclusive beachfront resorts and urban-centric hotels. RIU All-Inclusive Resorts offer their famous all-inclusive experiences in the world’s best destinations. Check-in, put your wallet away, and enjoy your stay in paradise! Your all-inclusive escape awaits and we’re here to help. My first trip to Cuba was not a vacation...it was so much more, an experience really. And I left knowing I would go back! How can that be, isn't it just another Island in the Caribbean? There are the classic cars of course, and rum..and cigars... but there is so much more. From the moment I looked over the city of Havana there was a sense of wonder and couldn't wait to explore and figure it out! There are so many unknowns when traveling back in time to this mysterious country and I have the honor of working with, in my opinion, the best People to People group tour company in Cuba, including the English speaking Cuban guides that are proud and excited to introduce you to their beautiful country and culture. If you have a group of 10 (think of that, only 5 couples) up to 40 , I can arrange a 7 day tour of this beautiful Island customized to what your group wants to see. Photographers? Hemingway buffs? Old car enthusiasts? Doctors or teachers? These special interests can all can be incorporated into a trip of a lifetime. My first trip to Cuba was a cruise where we had two full days in Havana. Our same tour operator does amazing cruise tours for groups of 20 or more. I feel this is a country that you need to experience first hand before you can give advice on travel. It isn't scary in the least but the rules are very different. What did I love the most? The beautiful people of Cuba, you will too!